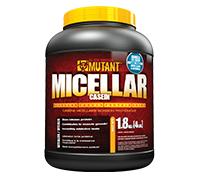 MUTANT MICELLAR contains micellar casein which is a revolutionary protein that is undenatured. It delivers amino acids to your bloodstream for up to 7 hours after one serving. Slower releasing proteins help prevent your body from slipping into a catabolic state — a condition where your body actually starts eating itself. During catabolism, your body sends signals to utilize your muscle's amino acids to meet its metabolic needs. This condition wreaks havoc on muscle tissue and can hold your gains back. To combat catabolism, take in slower-releasing proteins like MUTANT MICELLAR in between meals and late at night before bed. If you're sleeping 7 or 8 hours each night, consuming MUTANT MICELLAR before bed to slowly nourish your body while you sleep makes sense. Directions: Add 1-2 level scoops to 250-500ml of cold water, shake vigorously for 10-20 seconds, and slug it back!